Poker is a wash for players in the state of Michigan. On one hand online poker is illegal, but on the other it’s still ok to host and participate in home poker games. There are also a number of casinos that run poker games. The bottom line - Michigan residents do have options for playing poker and gambling in general – they just may not be the options you want. In 1999-2000 laws were passed that made gambling on the internet illegal. However, the word gambling was removed from these laws, theoretically making online poker legal. Or at the very least a grey area. However, if you visit the State of Michigan’s website and look to their gambling pages, you’ll see that they make it clear as day that gambling over the internet is illegal. Is it legal to gamble over the Internet in Michigan? Currently under state law it is illegal to gamble over the Internet in the State of Michigan. However, the FAQ or answer page isn’t dated. So we don’t know if this was published before or after the laws were passed in 1999-2000. Not only that, but poker sites that tend to prohibit players from strict states from signing up are allowing players from Michigan to sign up to play. So even it is illegal, it doesn’t look bad enough for sites to prohibit players from signing up, nor are players being arrested and charged for playing online. Home poker games are legal. But the players cannot collect fees or rake. The only money players can walk away with is money won from the other players while playing poker. (v) "Gambling game" means any game played with cards, dice, equipment or a machine, including any mechanical, electromechanical or electronic device which shall include computers and cashless wagering systems, for money, credit, or any representative of value, including, but not limited to, faro, monte, roulette, keno, bingo, fan tan, twenty one, blackjack, seven and a half, klondike, craps, poker, chuck a luck, Chinese chuck a luck (dai shu), wheel of fortune, chemin de fer, baccarat, pai gow, beat the banker, panguingui, slot machine, any banking or percentage game, or any other game or device approved by the board, but does not include games played with cards in private homes or residences in which no person makes money for operating the game, except as a player. Do Casinos in Michigan Offer Poker? Yes. Residents can choose from over 25 casinos, 3 of which are located in Detroit. The most popular casinos include the MGM Grand Casino and the up-and-coming Gun Lake Casino in Wayland. Casino revenue is huge for Michigan. In fact, the 3 casinos in Detroit generate over 300 million per year. The state has even generated more revenue than the casinos in Reno, Nevada. We receive a lot of questions about the legality of poker and online gambling in Michigan. We thought it would be helpful to post those questions and our answers here. 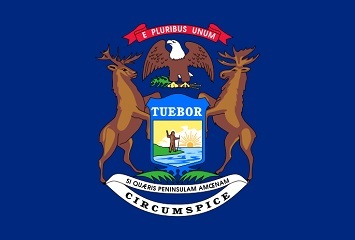 Will online poker be regulated in Michigan? The MGM has been vocal about their desire to regulate online poker. Representative John Conyers has been, too. However, their efforts have more or less been on a federal level, and not so much on a state (intrastate) level. So at this time it’s difficult to call. You can call it a coin flip. Is there an online poker room that accepts players from Michigan? Despite online poker being more or less illegal in Michigan, you’ll still find poker sites that accept residents from this state. This is unusual given that many US facing poker sites exclude players from states that are clearly against online gambling. But that’s not the case for Michigan. Residents can still sign up to poker sites such as Bovada, BetOnline and Sportsbetting Poker. What other forms of regulated gambling is offered in Michigan? Other than their commercial and tribal casino gaming, Michigan also runs para-mutual horse betting and a state lottery. In fact, Michigan does 48+ million per year in ticket sales. What Michigan does not allow is dog racing, slot machines, video poker or any other form of similar gambling. Where can I read more about Michigan poker laws? Here are some interesting facts about online poker and gambling in the state of Michigan. Michigan native Joe Cada won the 2009 World Series of Poker (WSOP). Detroit, Michigan is the 4th largest US casino market by annual revenue. The state brought in over twice as much revenue as the casinos in Reno, Nevada did in 2012 -- $1.417 billion. Known Detroit Tiger power hitter Cecil Fielder was sued by NJ Casino Trump Plaza Hotel for gambling losses sustained in late 2004. In fact, it was reported by the Detroit News that Cecil Fielder was suffering from gambling problems.